Why go with ArrayTech Solar Solutions? Your Solar PV system is as good as your solar modules, which constitute the heart of the system. ArrayTech brings you Made-in-Japan modules from Solar Frontier KK of Japan, the world leader in CIS technology. All Solar Frontier modules are manufactured in Miyazaki, Japan. Japan is renowned for its attention to detail and high quality production. Multiple moisture barriers and robust construction ensure the reliability of Solar Frontier modules. Solar Frontier modules meet global certification standards like IEC, JET, UL, and California Energy Commission standards. Solar Frontier’s unique CIS technology uses zero cadmium, is lead-free, and has no special recycling requirements. At the Atsugi Research Centre (ARC) in Japan, Solar Frontier continues pushing their proprietary CIS technology to the next level by improving module performance. CIS modules have a unique light soaking effect on initial exposure to sunlight, which allows for higher output than factory spec. This has been proven by field data from around the world. Compared to polycrystalline silicon technology, global field data show consistently higher output ratio (kWh/kWp) for CIS modules – that is, our panels produce more energy for every kilowatt-peak you install. It is the combination of properties embodied in CIS technology that makes it so special. It offers the best possible solution for generating the highest possible energy yields – even under the most difficult of circumstances. Hence, when you opt for Solar Frontier modules you get the four-fold benefit – good low light behaviour, high shadow tolerance, high temperature stability, the light soaking effect – higher yields (kWh) under all conditions. CIS Solar Frontier modules have high temperature stability. This means your installations work at their optimum even during high summer or in warmer regions. Modules that are exposed to an ambient temperature of 30 °C can reach surface temperatures as high as 70 °C. Hence, temperature stability of CIS is a great advantage, and reflected in energy production 10% higher than crystalline modules. In all photovoltaic modules, output diminishes as temperatures rise, which results in yield losses. This is why the performance of conventional technologies is considerably lower in the summer months or in hot regions, in spite of high irradiation values. Temperature has less effect on Solar Frontier’s CIS modules than on crystalline silicon modules, which means Solar Frontier modules have higher temperature stability. This is reflected in a lower temperature coefficient of the output, which is usually indicated on the datasheet as a percentage per degree Kelvin. In real life conditions, installations often get partially covered by shadow or there may be cloudy and low-light conditions. Solar Frontier CIS modules show a more stable power output than crystalline silicon panels due to high shadow tolerance quality. Combined with light soaking effect – a chemical reaction that increases the rated power output when placed under the sun – CIS modules generate more kilowatt-hours per kilowatt-peak installed, the key to financial success of any project. 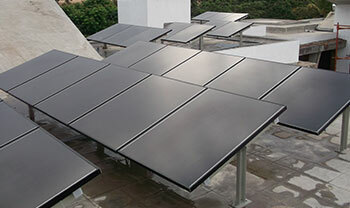 Solar Frontier’s modules have been installed in a wide range of climates, from northern Germany and Japan and India to near the equator, on office buildings, commercial complexes, institutions etc. Highest yields – even in the shade. Thanks to their high shadow tolerance, Solar Frontier modules are efficient even when shadows are cast over the modules or their surfaces are partly covered. The reason for this can be found in the different cellular structure. The square silicon cells in the module are connected in substrings. On the other hand, the long, very narrow thin-film cells are connected in series. The entire c-Si module stops working as soon as a small area, a single cell, for example, is covered or shadowed. In contrast, the CIS module continues working, only the covered or shaded area stops producing energy. The results are higher yields even in the shade. This has the advantage that some shadowing is acceptable in designing the system, in order to achieve the highest yields. If defined shadows are to be expected, (for example: horizontal shadows in the morning or evening cast by a shed roof, or in a field system), then energy production can be optimized: in this case, the CIS modules must be installed with the cell perpendicular to the cast of the shadow. If shadowing of a module or a module row of x% occurs, there is still energy production of 100-X%. The cell structure of the modules and the associated shadow tolerance has the added advantage that the distance between module rows can be reduced in free-field installations and on industrial flat rooftops, so more generating power, expressed in Watt-peak, can fit in a given area. Are you a Solar Developer? 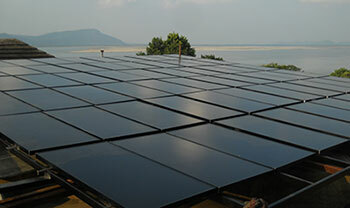 ArrayTech is your specialist in Design and Engineering of PV Power Plants. Get access to PV Simulation, Project Planning and Optimum output. In other words, more bang for your money! With ArrayTech as your energy partner, get higher efficiency, durability, extremely good price/performance ratio. Superior output means your money earns more! Let ArrayTech be your energy provider for self-reliant, modern and ecological solar energy production. Get a viable ROI plan, energy credits and watch your financials improve!